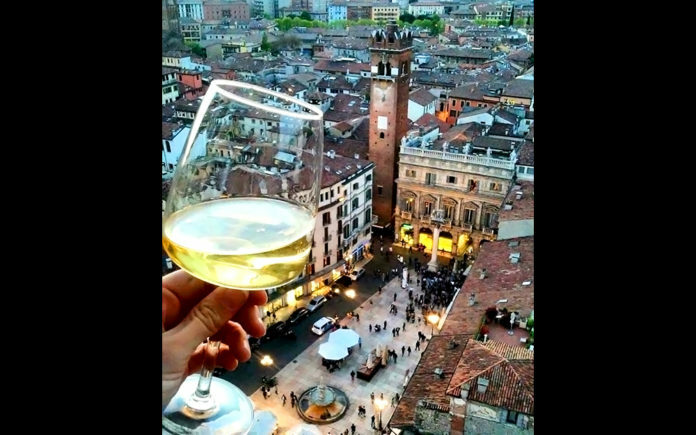 I can’t believe it’s been a year since I was whooshed away to Verona Italy to enjoy the largest annual Italian wine festival known as VinItaly. Enthralling and magical, delicious and over-whelming, the entire experience was an event of a lifetime that easily encourages another look at this charming city and wine region. I’ve heard from many of you readers this past year who read the two columns I wrote from my trip, “A Very Merry Gentleman in Verona”, and, “From Verona With Love,” and who are considering traveling to the region this year or soon enough and/or are interested in the famous wines therefrom. Ancora!—prego! Please allow me to reminisce again: I was always more of a Southern Italy type-guido with family connections and the love of the Mediterranean waters washing about the shores in Napoli, Sicilia, Sorrento and scintillating other sites. But when I landed in Milano, just south of the snowy Alps, and ventured the east-bound train to Verona with the Alps still right on my left side, my Italian heart nuzzled up to the North. I know Venice, Florence, and Rome all get the fanfare but one can appreciate the same la dolce vita experience when visiting the moderate size Verona with its Roman-era architecture, history, and rich culture. And then of course, we have the romance and escapades of Romeo & Juliet, and Dante’s Divine Comedy where in verse he calls Verona “the Italian City of Love”. Actually, getting in and out and all-around Verona is ten times easier than with the larger famous cities of Italy. One can enjoy an entire old town walk-about in one day that include stopping for lunch, gelatto, espresso, an apero, and an al fresco dinner with beautiful views of parks, towers, buildings and the Roman arena—the largest outside of Rome. One of the de rigueur visits is the Antica Bottega Del Vino wine bar which has been open since 1890. This is where vino lovers get their strength in Verona (outside of VinItaly on the other-side of town in April). Unbelievably, they have a 4,500-selection wine list to order from, which contains most of the great premium wines of Italy and around the world for that matter. As you’d expect, Antica Bottega is so much fun and lively that there are always a group of folks milling around the front door even when there’s plenty of room inside. And within the bottega, one can wander to rooms that open to other rooms which are filled with wine bottles from the 1800s, 1900s, and this new century. Allora! One can simply walk up to the bar and order a glass of one of the day’s 30 or so recommended wines that are scrolled on the chalkboard. And order up as well scrumptious plates to accompany your quaffs. Or you can sit at a table and mangia the more substantial Venetian pasta or beef cheeks braised in Amarone. And speaking of Amarone—this being il grande vino di Verona, the most potent form of Valpolicella, nuanced sweet but dry, dense fruit and a touch bitter, the results of drying selected grapes off the vine to make concentrated wine, is the climax of every Veronese feast. Well—at Antica, you can find at any time some daring Amarone from decades past or from last week’s barrel overture. Another place to visit is the Osteria Ristorante Ponte Pietra where you can catch some of the loveliest views of Verona, as the eatery is perched on the banks of the Adige River. The local dishes are elegant and delicious—the whole setting is simply romantic. The wine list is strictly Italian (Champagne of course), focused on local Veneto wines such as Soave, Garganega, Bardolino Classico, and Valpolicella. As I mentioned last year, I rented a Lancia and toured the entirety of Lake Garda, racing about at times like I was in a Lina Wertmüller’s Italian adventure film, and, stopping every so often to sit and enjoy the settings with a glass of the local red wine and then an espresso doppio to get me back on my way. The sun was out and the sights were simply spettacolare! One of the lakeside towns I stopped at was Limone sul Garda. The area is famed for its limes. And the liquor I enjoyed at the bar was limoncino [lee-mon-CHEE-no] The lime version of limoncello. Delish!—I might have had two shots, I can’t remember, but I did my usual hit of espresso for the road. My entire trip—1st class flight, lodging, meals, and the event, was at the behest of the Italy-America Chamber of Commerce of Texas, who apparently found and liked my Italian wine articles and sent me on my way to represent them. Was I living the dream that week or what! Just down the road from my luxurious Le Ali del Frassino lodging, are some of the vineyards sourced by Zonin Italian wine company. Now I’ve been a loyal fan of Zonin writing often of their world class wines and sparklers. One of the best examples of both quality and price is the Zonin Prosecco DOC Cuvée 1821 ($13). We cannot get enough of this delicious refreshing Zonin Cuvée 1821 in our desert! We carry it at Ralph’s Market here in Palm Springs and I always recommend this prosecco because it’s an especially dry version. Many other popular brands are on the sweeter side. The Zonin Cuvée aroma signals elegance with a focus of fresh green apple with a squeeze of lemon. On the palate, the wine is wonderfully dry and pleasantly fruity with fresh notes of apple, pear, apricots, and lemon grass along with that characteristic almond finish. We love it with a Caprese salad, hot & spicy chicken wings, pan-seared salmon with lemon & basil, and, with black pepper, grated cheese & olive oil drenched pasta. It’s also great with light desserts, or as a dessert itself. Cheers again… from Verona with Love!